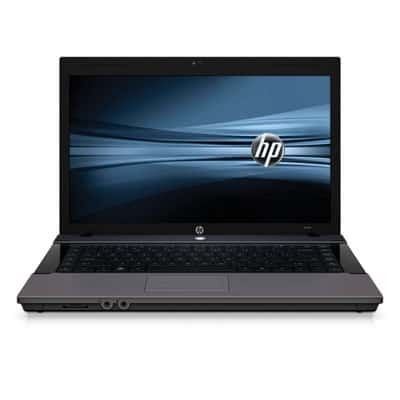 Here we have a HP 625 notebook computer, that come with a AMD CPU and ATI chipset and graphic card. For this combination of hardware, it is common to wok on a highet temperature, so that’s why need to clean the fan more often so how we avoid overheating of the system. Here is the exact configuration. Now, let we see how to clean the CPU Fan. First we need to remove the bottom cover. There are 4 screws that we need to remove, assigned with the red circles on the next picture. After removing the cover we have this underneath. 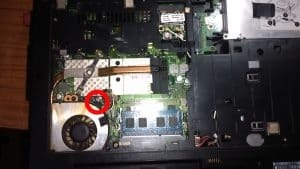 We need to remove the screw and detach the connector assigned with the red circle on the previous picture. 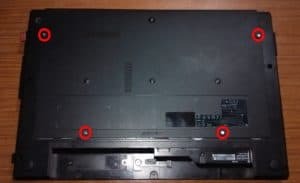 There is one more thing that you can do to improve the cooling of the laptop. There is a way to make the fan spin at max RPM (Rotations per Minute). We can do that by cutting the middle (white) wire (see next picture). But, when you gonna do that the noise that the fan make will be at higher level, and some can take this like very disturbing. But, that is a compromise that you will need to take. 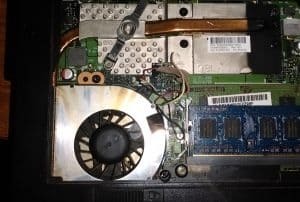 This entry was posted in Hardware and tagged CPU Fan, HP, Overheated by Tome Trajkov. Bookmark the permalink.